Hotels in Nessebar, Bulgaria available for booking. Make reservations now! Nessebar is located in southeastern Bulgaria. 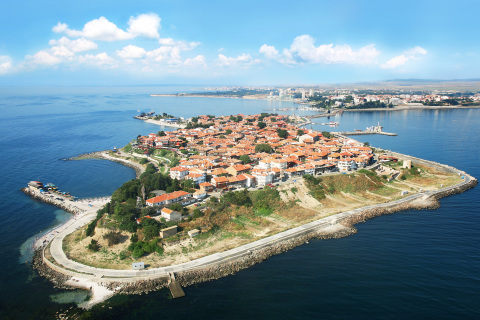 Nesebar is an ancient city with a rich history and was founded under the name Mesimvria. The town was declared an architectural and archaeological reserve. In the old town are preserved valuable historical monuments. You can visit the Archeological Museum, Ethnographic Museum, Church of St. Stephen, the Church Sv. Spas. New part of town is distinguished by modern architecture, offers a variety of accommodation, restaurants and discos. In the southeast is South Park. PMG Laguna Apartments is located in the northwestern part of Sunny Beach and has a large outdoor pool. All units are air-conditioned and have a balcony.